Tips and solutions for fix trouble at MICROSOFT LUMIA 550. This is cheap Microsoft Windows (phone) 10 OS smartphone with 4.7 inches LCD screen and have 8 GB internal memory and 1 GB RAM for multitasking applications. Although it have limited internal memory capacity, but we still can expand using microSD external memory maximum 200 GB. MICROSOFT LUMIA 550 use Qualcomm processor with Quad Core 1.1 Ghz clock speed. How to Fix or Problem Solving for Recovery MICROSOFT LUMIA 550 hang or not responding or malfunctions or stuck or freezing or bricked ? This phone have 8 GB internal memory and already installed with Microsoft Windows 10 operating system. With this internal memory capacity, we still can install MICROSOFT LUMIA 550 with several interesting applications from Windows Store like Facebook, Instagram, Whatsapp, Blackberry Messenger (BBM), Skype, Viber and many more. But we have to know that maybe some applications is not compatible with this phone. If we have installed that kind of apps, then MICROSOFT LUMIA 550 will become hang or stuck or bricks or frozen or boot logo loop or LCD touch screen not responsive. We have to force shutdown or force reboot or force soft reset to clean temporary files and caches. If this problems still happen, then we have to do hard reset or master format. Please note, doing hard reset will remove or wipe all important files at MICROSOFT LUMIA 550, therefore we have to backup all important files first before doing hard reset. How to Force Shutdown or Force Soft Reset or Force Reboot or Force Restart MICROSOFT LUMIA 550 ? What should we do when our MICROSOFT LUMIA 550 get hang or LCD touch screen not responsive in the middle of running applications? We have to force soft reset or force shutdown or force reboot to clean temporary files and caches. Please remove back cover case of MICROSOFT LUMIA 550 and then unplug the battery, wait about 5 until 10 seconds and put again the batter at right positions. Press again POWER button to trun ON this phone. This process will restart all running applications from beginning and will not remove any important files. We can do this shutdown process when our phone still not get trouble for clean up the temporary files or cache or to refresh the running applications. Please Press and hold POWER BUTTON for several second until the phone shutdown by itself, if you see ‘slide down to power of‘, do slide the icon at this phone then MICROSOFT LUMIA 550 will turn off. We need to press Power button again to turn on this phone. How to Master Reset MICROSOFT LUMIA 550 to Factory Default ? The MICROSOFT LUMIA 550 will do the hard reset format, wait about three until five minutes. While waiting you will see the gear appear until it finish. There are several games and entertainment that can run without problems at MICROSOFT LUMIA 550. But some applications can make trouble to the operating system, it can become damage or corrupt. The MICROSOFT LUMIA 550 will act not normal or not responsive or can not run properly. We need to reformat or reinstall the operating system. But first we have to know that clean factory default Microsoft Windows 10 operating system file source already saved safely inside MICROSOFT LUMIA 550 ROM or internal memory, therefore we do not need to copy or connect MICROSOFT LUMIA 550 with other device when we want to reformat. Just follow simple steps to hard reset above, then clean factory default Microsoft Windows 10 operating system will be reinstall automatically. How to Unlock or Fix or Bypass or Solutions for MICROSOFT LUMIA 550 forgot password code or security lock screen or pin (lost password)? It is good to activate security protections at MICROSOFT LUMIA 550 by using factory default security menu setting. But the problems will be happen when we forgot security protections pin password at MICROSOFT LUMIA 550, what should we do? Unfortunately we can not bypass or unlock forgot security pin password protections at MICROSOFT LUMIA 550. We have to do hard reset or master format MICROSOFT LUMIA 550 using hardware button combination key like steps at #Option 2 above. How to Improve Performance MICROSOFT LUMIA 550 to make run more faster? MICROSOFT LUMIA 550 is the low price Microsoft Windows 10 smartphone, therefore we can not expect to much from Qualcomm processor using 1.1 Ghz clock speed. But base by benchmark review, we can have average speed performance of MICROSOFT LUMIA 550 when running for standard chat, browsing, playing games, email, social media and several other applications. But please do not install too many applications especially the apps that not very famous, because some of them will make our MICROSOFT LUMIA 550 resources become insufficient and make become slowly. If we want to make our MICROSOFT LUMIA 550 performance run faster again like new, then please consider to do hard reset or master format. 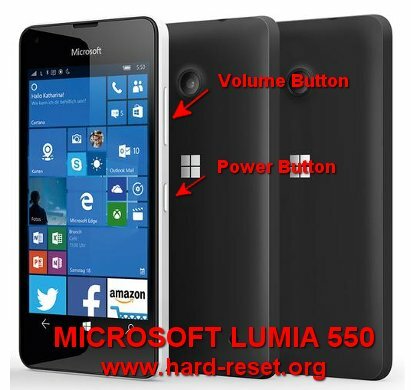 What is the Secret Code Key for Hard Reset MICROSOFT LUMIA 550 ? There is no secret code for doing hard reset or master format MICROSOFT LUMIA 550. Just follow the step above to hard reset is the easy way to do. [A] Hi, there are two options for hard reset your Microsoft Lumia 550 whether using menu setting if your phone still can boot or using hardware button combination key. Both steps will reformat your Lumia 550 operating system to factory default. The information from this page describe about how do you do a hard reset on a microsoft lumia 550,lumia 550 boot loop,lumia 550 bootloop,reinitialiser Windows phone ZTE. If you need another resource for hard reset, use search function at this homepage or find from our related posts. How to Easily Master Format SAMSUNG GALAXY J7 MAX (G615F) with Safety Hard Reset? Hi, there are two options for hard reset your Microsoft Lumia 550 whether using menu setting if your phone still can boot or using hardware button combination key. Both steps will reformat your Lumia 550 operating system to factory default.